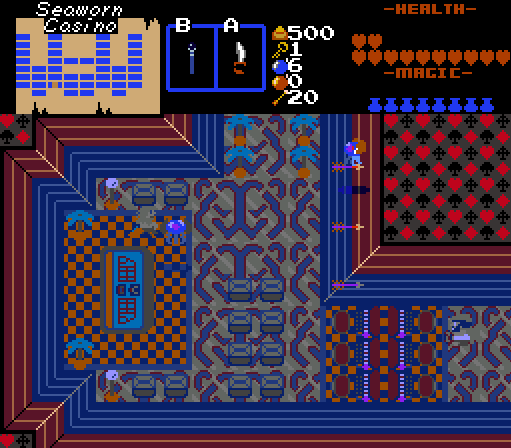 Prometheus dealing with Ichthyocentaurs and Jellyfishbirds in Level 8, The Kraken, aka Seaworn Casino. Maybe I can brighten some of the browns on the enemies. I was thinking that with the water, but it kind of ruins the theme to remove the water. Anthus: Voted here. A fitting last screen for a dungeon that has a lot of attention put into it. Joelmacool: I like how multiple environments bleed into one screen. Some tiles look slightly off like the bridge and seashell. 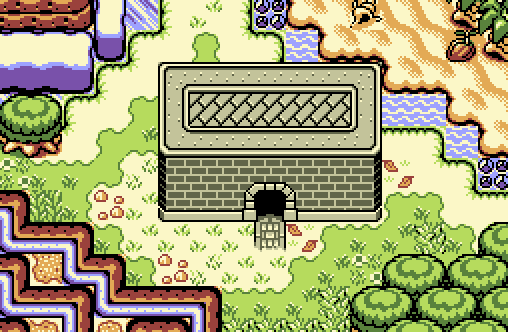 Shoshon the Elegant: It's very unique and creative, and I love the variety of tiles helping the setting. EnnonFenom: Not quite sure what to make of this screen, sorry. Looks like it fits your current artstyle. I like the transition between climates concept, but it feels very cramped. Maybe if the grass went under the snow piles and the trees or mountains in the lower corners took up less room. What is that animated gray strip? And I do challenge anyone to put up or shut up. Let see your 100% custom work. I hate to answer to these kinds of things, but (in any and every field, whether it be screen design or filmmaking or cake-baking or whatever), the ability of someone to do well in the field itself is orthogonal to their ability to criticise. If I'm a bad cook, that doesn't mean I don't know what good food is. If I can't design a game, that doesn't mean I don't know what's fun. If I'm a bad artist, that doesn't mean I don't know what I like to look at. That said, you do need some experience to know what you're talking about, and at least understand the effort that goes into these screens. I'm just annoyed every time someone suggests that just because someone can't do better than you, their opinions of your work are irrelevant. Joelmacool: I do like this screen a lot, it just feels very slightly empty. Not entirely sure why - maybe because the building itself hasn't got that much detail? All in all, though, nice screen. Shoshon: It took a bit for me to realise that that was water was actually water and not just a recolour of the lower walls. Maybe if there was even a little texture on the top of it? 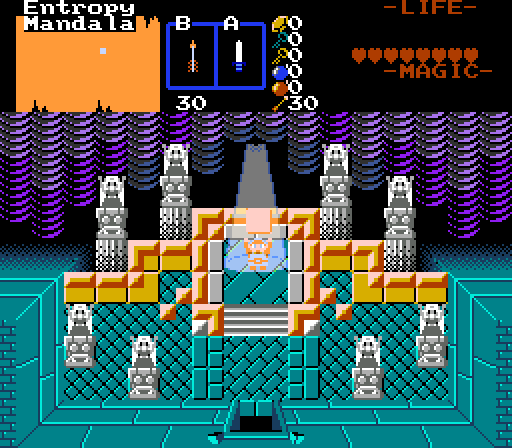 Also, the screen is a little noisy and the enemies kind of blend in, but again, I think it'd work better in motion. EnnomFennom: Took me a bit too long to realise she even had arms. Not sure I like the look, or that it fits well with the floor, but there's some good stuff there that could be used somewhere else, if in the right context. You say this is all old stuff - show us some of your new stuff. I'd like to see how you've improved (if at all ), and we'd be able to give feedback on what you've done recently. Yeah. It's much better in motion. Although there are a couple enemies I am decently likely to edit because they blend in too much even in motion. ...Perhaps sometime within the next 3 SotW's. Hence why "in the next 3 Sotw's"
Anthus - Very nice work here, the screen looks pretty well made. I like the overall design and the spotlight at the top. Pretty good work all around. Joelmacool - Pretty nice and clean shot here, very nicely put together. The snow is an interesting addition, I assume this is kind of a region where snow is melting or something? Good work anyways. Shoshon - Interesting screen here. I do believe it will look better in motion with the animations and stuff, but for what it is, it's some cool spritework. I'm still not entirely sold on the floor tiles (except for the checkered carpets), but it works. EnnonFenom - Well this is... something lol. The fairy seems pretty neat, but I dunno what's happening in the background. Why is the wall on the bottom-left area opening up like that? I don't really get it. Edit: Didn't realise that got answered in an earlier post... that's uh interesting I guess? I voted for Anthus this week. I am not mad, are you? Screenshot of the Week in 2018 is surely a thing.